A display of bold and sometimes baffling works fills a Warwickshire gallery, showing many work’s from an artist’s long career. 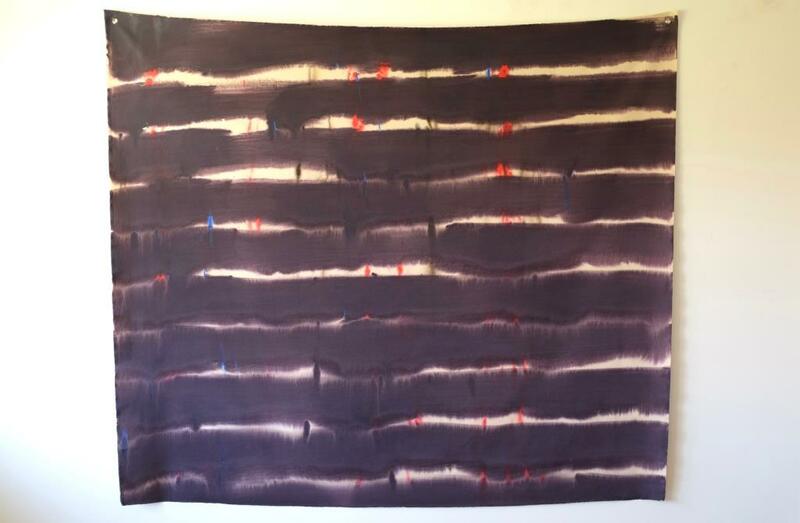 Dictionary of Silences is a retrospective of paintings by Colin Hichmough, who lived in Leamington for many years, and whose works are now being shown in the Leamington Spa Art Gallery & Museum until January 8. Hitchmough studied fine art at Liverpool College of Art in the late 1960s, and then Birmingham College of Art. He then worked in Rugby for three years, before moving to Leamington where he lived until 2009, most of the time teaching at Warwickshire College. He also taught on the Fine Art Degree Course at Leamington Warwickshire College and the University of Central England. He is married with two sons, and now lives with his wife on the West Sussex coast. This exhibition shows works dating from the 1970s to the present day. In a well-written and attractive brochure to go with the exhibition, senior curator Chloe Johnson writes that “the ideas underpinning Hitchmough’s works are varied, but they deal with one single, complex concern: the notion of painting”. He was also exploring the physical materials used in painting, and began to suspend canvases like banners or flags rather than stretching them. In the 1980s the focus switched apparently to the surface of paintings and fluid brush work, and in the 1990s to box-like shapes, or “containers for ideas”. 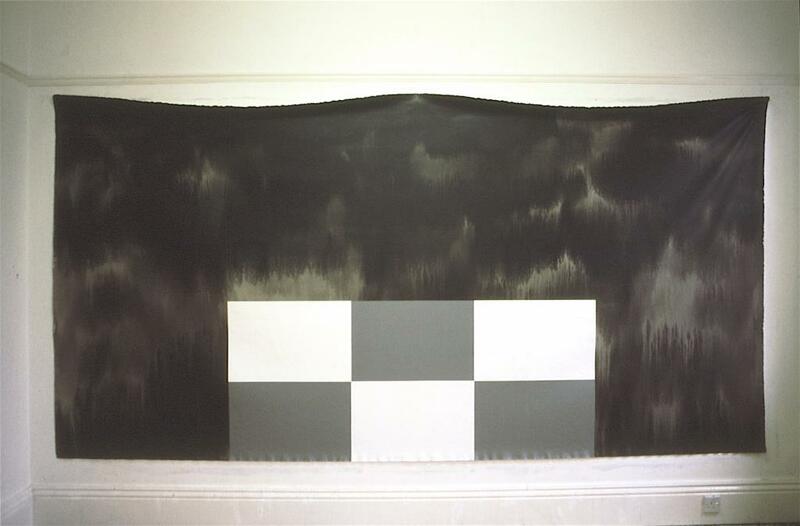 The People’s Flag from 1982 is a big mostly black canvas with white stripes, and another from 1972 is blue and textured, looking like denim, with an almost tie-dye look to it. Untitled from 1971 is the earliest work in this show, and takes up one wall of the gallery, a T-shaped work with bits pulled up and held there, subverting the idea of the flat canvas. New York House from 2001 is very different, mostly black with a six dark grey and white, sharp-sided rectangles painted in the bottom. Terrapins and some similar works combine wood and canvas with sticky substances to create things that look organic and wholly fake at the same time. 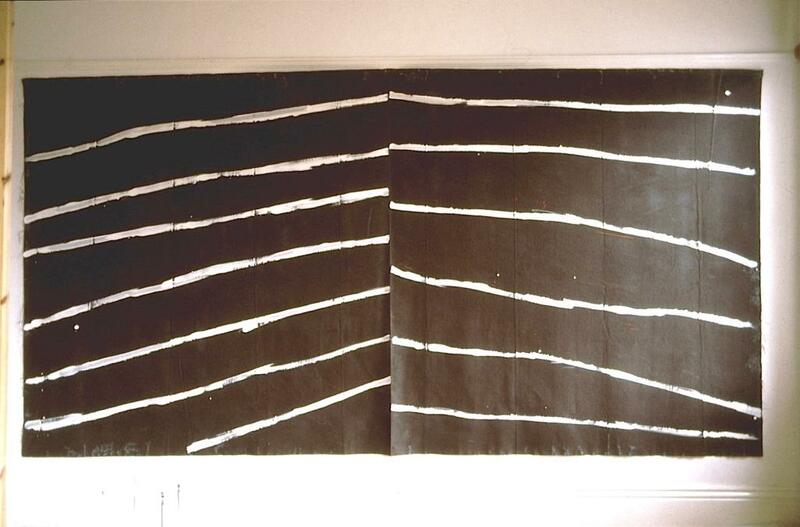 Small silences from 2014 is a series of small works with parallel hand-drawn black lines stacked up like papers, or further apart to change the unity of the work. This is one of the works inspired by a holiday visit where Hitchmough misheard a guide talking about what he thought was a Dictionary of Silences, and the lines represent piled up canvases. The Dictionary of Silences painting is large and black, with imposing white blurred lines across it. It’s an interesting exhibition which in many ways I struggled with at face value, but Chloe’s writing and the useful information on the gallery walls brought more knowledge and understanding to what is a large body of work, in more ways than one.